[JAN. 8, 2005] Question: What can I do for fun next summer and still get paid for it? Answer: Be a director for Lincoln Community Theatre and, as the season theme says, "Light up the Night"! On Sunday, Jan. 30, the board of LCT will interview applicants for the salaried positions of artistic director, technical director, audiovisual technician and musical accompanist. Scheduled productions are "South Pacific," June 17-25; "I Hate Hamlet," July 8-16; and "Children of Eden," July 29 - Aug. 6. All performances are in the comfortably air-conditioned Johnston Center for Performing Arts on the Lincoln College campus. Please send your resume to the LCT secretary, Holly Woodhall, P.O. Box 374, Lincoln, IL 62656. Include as much detail as you can regarding a proposed staff, should you have one, considered set designs, and rehearsal and production philosophy. Musical accompanist applicants should be prepared to display their talent with a short piano selection or tape. You will be contacted for interview location and time schedule. 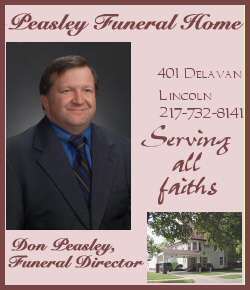 For further information, keep watching www.lincolncommunitytheatre.com or call Jean Gossett (217) 732-7542. Your advertisement could be seen here 6 days a week for less than $20 per month.